If for any reason you are not satisfied with your transaction, simply return our check or call within ten (10) days of the date on the check and we will reutrn your item at no cost to you. No questrions asked. We guarantee it when you sell gold to us! 'Sell Your Gold Reserves', PBOC Researcher Tells the U.S.
(includes a special pre-paid envelope and instructions). Place your unwanted scrap gold and jewelry in the specified package and drop it off at your most convenient mail box. After we receive your package, we will assess the contents and mail you a check within 24 hours of receipt. View the SellGold™ Gold Show and find out how you can sell gold and get cash from the comfort of your home. As seen on link to the longer commercial here. Sell Gold is an established online and offline gold buyer. Our professional staff has been in the business of evaluating and purchasing fine metals for over 25 years with thousands of satisfied customers. The Sell Gold team prides its self on accurately and efficiently evaluating your gold and paying you the highest prices in the industry. When selling your gold to us, feel confident you are dealing with a trusted, established industry leader whose first priority is your satisfaction. 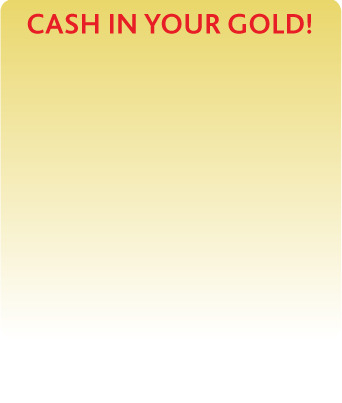 Are you in need of money and looking for a reliable, hassle free way to get cash for gold? We offer you easy cash for all your authentic gold, even if it is damaged or broken. In addition to gold, we purchase sterling silver and platinum. We accept everything from broken or tangled chains, un-matched earrings, old class rings, coins, bracelets, dental gold and more. Gold is so valuable because it's rare and the most stable commodity on Earth! Gold prices are at historical highs which makes this the most opportune time for selling gold. This is your best chance to get cash for gold, for your unwanted gold and we pay you top dollar for it. The process is fast, simple, hassle-free and backed by a 100% satisfaction guarantee. Request your FREE, no obligation Sell Gold package today! Lately, I've been hearing about all the money to be made from sending in old and unwanted jewelry. After going through my collection, I pulled several pieces that either are broken or I no longer wear. I sent my jewelry in to Sell Gold using the free kit and was paid in no time! I recently cleaned out my closet for a garage sale. I found a bunch of old jewelry, but I had no idea how much any of it was worth, I didn't want to put it up for sale. That's when I heard about Sell Gold. I sent in my old and broken chains and rings in and got paid more than I ever would have sold it for. After a recent breakup with my fiancé I decided I no longer wanted all of the jewelry he had bought me over the course of our relationship. I didn't know what to do with it. My mother told me about this website so, I requested a Package and sent in my gold. I received more money than I could have imagined.